I was unfortunately disappointed by the Rebirth Green Lanterns Vol. 1: Rage Planet, a careless and overdone first outing for Earth's newest Lantern pair. Art and story inconsistencies abound, over mostly predictable dialogue and a story far too padded out over six issues and a special. 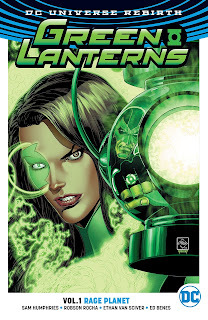 There are a couple key moments each for Green Lanterns Jessica Cruz and Simon Baz, suggesting the premise is far from irredeemable, but writer Sam Humphries will have to get beyond the surface of these characters to deliver something really palatable. Humphries must start with Jessica and Simon at certain extremes in order for them to meet in the middle as the story processes. But the net result is for each of them to come off unlikable and a little foolish, as in the first main chapter where, after locating a murdered alien, Simon haughtily believes their job as Lanterns is done and they should just turn the case over to the police. Humphries, not necessarily writing for the trade, repeats the characters' most salient attributes like a mantra; every couple of pages, we're reminded through narration that Jessica is anxious, Simon is hotheaded, and the Red Lantern Atrocitus is trying to establish a beachhead on Earth -- again and again until the characters become one-note, reduced to just these elements. And mistakes abound, evidence perhaps of a new creative team finding its footing -- and there are over a dozen artists and inkers here, always problematic, so to an extent the book doesn't even yet have a set creative team. When the Lanterns find the alien body there's an errant sound effect, the "drumbeat" of the Red Lanterns, that the characters don't notice and there's no place for it to be coming from. In one issue Jessica goes on about how she hasn't talked about being Green Lantern with her sister, but the next issue has a flashback to before that scene where they talk about it in depth. Artist Robson Rocha has Jessica inexplicably smiling in a scene where she's otherwise being attacked. Between two artists, the Red Lantern Bleez's clothes change page to page. A number of times the dialogue suggests the characters see things that aren't actually drawn in. Problematically Rage Planet starts from the premise of Atrocitus leading the Red Lanterns and Bleez as his lieutenant. Though an earthbound "rage plague" does mildly coincide with the end of Charles Soule's superlative Red Lanterns run, we last saw Atrocitus defeated and Bleez on the side of angels (not to mention there's a couple of deceased Red Lanterns also back on the page). Surely the inconsistency could be explained away, but the book doesn't bother to do so, and it contributes to a lack of sense of depth in the book. This is not a place for long-time Green Lantern fans, and that's to the book's detriment -- Robert Venditti's first Hal Jordan and the Green Lantern Corps manages to be relevant to the Green Lantern franchise's here-and-now without getting bogged down in continuity minutia. Neither does Humphries bother with what sort of career interests Jessica and Simon have or how they support themselves, nor any real details on the crime Jessica was a victim of, incongruously expecting the reader to already arrive with that knowledge. I am not sure Rage Planet does social anxiety disorders or post-traumatic stress any favors, often presenting it as a soundtrack of doubt in Jessica's mind with no outward signs (granted mental illness manifests in countless different ways but Humphries' portrayal seems more slotting doubt into an otherwise healthy person than a representation with real nuance). There's not a lot of rhyme or reason to when Jessica is able to fight her battles at the beginning of the book but freezes up later on, aside from what the story needs. That said, in the very last chapter I thought Humphries' "doubt talk" for Jessica got a mite bit better, and one of the issue's artists, Will Conrad or Jack Herbert, nails the scene where Jessica finally makes a sculpture-like construct, giving the splash page the delicacy and beauty it needs. So too does Humphries sometimes seem unsure what to do with Simon Baz, whether family man or hothead or rebel (some of this is evidenced in Humphries' Simon's irrational concern for the most generic of stuffed bears for his nephew); again, Soule's tough-but-sensitive Simon really ought be a model. At the same time, I really like the extraordinary Lantern powers that Geoff Johns and now Humphries have imbued Simon with, a preternatural ability to heal and also "emerald sight." The scene in which Simon momentarily cures Bleez and tries to rehabilitate her is especially good. All of this makes Simon unique and interesting, reminiscent in part of the early Ion: The Torchbearer days of Kyle Rayner before that character became more plainly omnipowerful. My sincere hope is that now that Green Lanterns Vol. 1: Rage Planet has its first volume out of the way -- premise set, characters established -- Sam Humphries' Rebirth book can only grow from here. Atrocitus and the Red Lanterns are a contrivance, used basically in this form too many times already. The prospect of a new ring, plus a classic Green Lantern bad guy on the way, would seem better to have originated with Humphries; perhaps a chance for Humphries to do his own thing will benefit the book overall. Unfortunately, the artistic inconsistencies continue after this volume, with even more pencillers joining the rotation, which is disappointing if compared to how most issues of Hal Jordan and the Green Lantern Corps were drawn by either Van Sciver or Sandoval. I found this arc a chore to read, but I'm glad I didn't give up on Green Lanterns, because Humphries's writing kept growing on me with each arc, and by the time his run ended I was genuinely sorry to see him go. Come to think of it, I went through the same thing with Seeley's run, only in a much shorter timeframe. I'm on the fourth volume now, and the first three-issue arc had a different artist per issue. Come to think of it, "Polarity" did too. That's always a bad sign on a book; I'm surprised they allowed that for a Green Lantern title. I did think this title got better especially in Vol. 3 (it's no Deathstroke but what is), but three issues of just kg jabbering with Kyle and Guy in Vol. 4 hasn't moved me quite yet. What're you reading these days? Everything but Harley Quinn, as usual (nothing against the character, I'm just uninterested in her as a protagonist). My favorite DC books right now are Mister Miracle, Batman, Aquaman, The Silencer, Deathstroke, Hal Jordan and the GLC, The Snagglepuss Chronicles, The Wild Storm and Michael Cray, and I have high hopes for Snyder's Justice League and trepidation for Bendis's Superman. Listed Silencer after Mister Miracle, Batman, and Aquaman, and before Deathstroke(!). I admit, I'm intrigued. Was that just an off-the-top-of-your-head listing or is Silencer really that good? Actually, I didn't list them in order of preference. It was more like first Tom King's books, then Dan Abnett's, and so on. But yeah, I do like Silencer a lot. It's the one New Age of DC Heroes book that actually feels unique and not like a Marvel concept shoehorned in the DCU, with a cool protagonist who's sympathetic despite her checkered past, surprising ties to pre-existing characters and a supporting cast I actually care about. It's just a shame that Romita left after just 3 issues, but Bogdanovic is a decent replacement. I like Bogdanovic a lot on the title. He reminds me a lot of Capullo. And according to the latest solicits, it looks like Patrick Zircher will have a turn as well. Green Lanterns was definitely a book that had a rough start, but eventually got better as Humphries found his groove. Seeley's run was very enjoyable, too.